As we approach the end of 2018 it is a good time to look back and reflect on what has happened this year. It has been my delight to have had the opportunity to work with front-line teams at University Hospital of North Midlands (UHNM) and to introduce them to the opportunity that health care systems engineering (HCSE) offers. This was all part of a coordinated, cooperative strategy commissioned by the Staffordshire Clinical Commissioning Groups, and one area we were asked to look at was unscheduled care. It was not my brief to fix problems. I was commissioned to demonstrate how a systems engineer might approach them. The first step was to raise awareness, then develop some belief and then grow some embedded capability – in the system itself. The rest was up to the teams who stepped up to the challenge. So what happened? Winter is always a tough time for the NHS and especially for unscheduled care so let us have a look and compare UHNM with NHS England as a whole – using the 4 hour A&E target yield – and over a longer time period of 7 years (so that we can see some annual cycles and longer term trends). The A&E performance for the NHS in England as whole has been deteriorating at an accelerating pace over the 7 years. This is a system-wide effect and there are a multitude of plausible causes. The current UHNM system came into being at the end of 2014 with the merger of the Stafford and Stoke Hospital Trusts – and although their combined A&E performance dropped below average for England – the chart above shows that it did not continue to slide. The NHS across the UK had a very bad time in the winter of 2017/18 – with a double whammy of sequential waves of Flu B and Flu A not helping! But look at what happened at UHNM since Feb 2018. Something has changed for the better and this is a macro system effect. 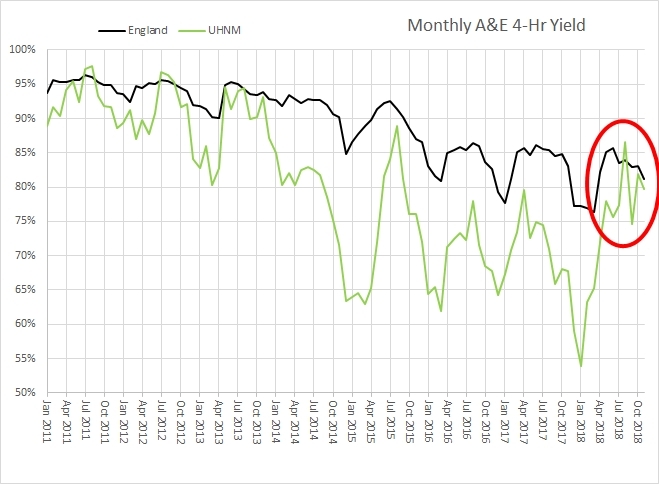 There has been a positive deviation from the expectation with about a 15% improvement in A&E 4-hr yield. That is outstanding!